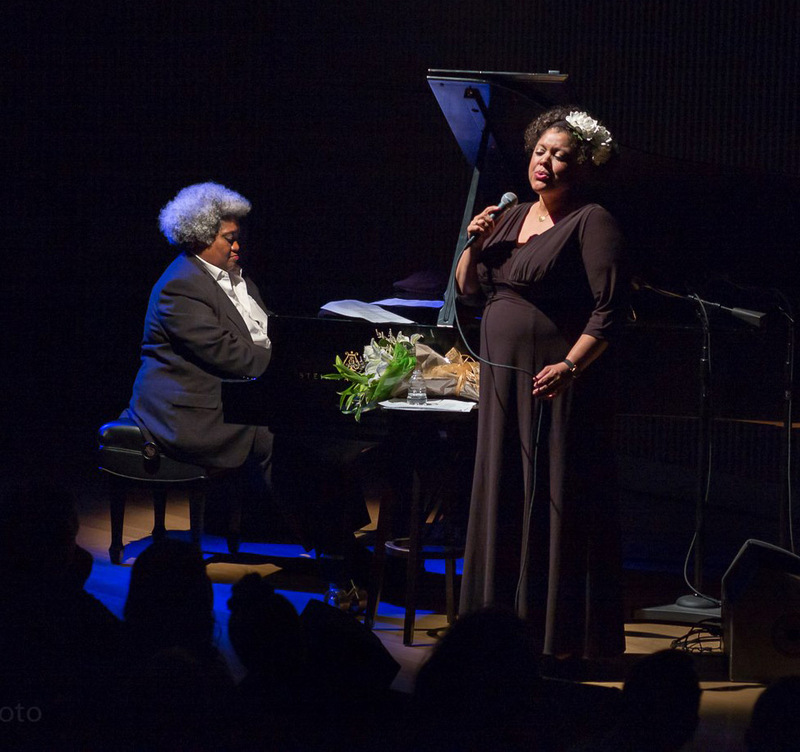 Jazz diva Kim Nalley and her band return as headliners at the Fillmore Jazz Festival again this year, appearing on Saturday, June 30, at 4:30 p.m. on the California Street stage. It all started for you on Fillmore Street, right? Yes. I was cleaning houses and I got a call from Chris Provo at Harry’s. They had listened to my cassette demo that had three tunes on it: Just Friends (bop jazz), Moonlight in Vermont (ballad) and Never Let Me Go (R&B ballad) They needed someone to work that night — and if it worked out I could have it weekly. They had a grand piano and the gig paid $300 for a quartet; my rent was $200 a month. I was cleaning a house in Marin until 5 p.m. and the gig started at 6, plus I needed to put together a band and get dressed up. I told the woman whose house I was cleaning I had to leave and she was incredulous. She said no — and that she was paying me more money and was a sure weekly thing. I called back Chris and asked if I could start the next week instead. He said whoever played that night would have the first shot at the weekly gig and that it might not be there next week. I told the woman I was sorry and left right away to assemble a band. I got the weekly gig and got a raise and sang at Harry’s weekly for a long time. From there, Ruth Dewson hooked me up with Eddie Petrillo and I started working at the Fillmore Grill, and then later with Peter Snyderman when he brought back the Alta Plaza. Does Fillmore still feel like home? Yes, I got married at Sherith Israel, my kids go to school here and my best friends either live or work here. I go to Peet’s on Fillmore, shop at Mollie Stone’s, get my hair done here. I still have dreams of leasing the old Alta Plaza space and reopening it as a jazz club once my kids get older. You’ve been a regular at the festival for ages. My first performance was in 2003. I was the poster girl, fresh back from living in Europe and about to reopen Jazz at Pearl’s in North Beach. What keeps bringing you back? It’s my favorite gig. I see everyone, even my old friends from the Harry’s days. Family and friends fly into San Francisco just to see me at this festival. It’s a party! What’s on tap this year? This year is a ’90s theme, so there are a lot of my friends from back in the day performing this year. I will be making the rounds, so don’t be surprised to see me jump up on a different stage to belt a tune! The ’90s were such an exciting time in Bay Area jazz. The acid jazz, hip hop jazz and retro-swing movement were nascent. I have not made out the set list yet, but I have a few new tunes in the pipeline. My band is Tammy Hall, Kent Bryson, Michael Zisman, Barry Finnerty and Howard Wiley. And of course as usual I’ll bring homemade lasagna for the after-show hang! You and your pianist Tammy Hall were part of a significant event on Fillmore last month at the end of longtime resident Kelly Johnson’s life — how did that happen and what did it mean to you? Kelly told me he looked forward to my concerts at the Fillmore festival and that he was there in a front row seat every year. I said I had never seen him there — and then when he invited me over to his place I finally understood. His living room was practically right in front of the stage! Near the end, he asked if any of my friends wanted to play his B3 organ, since he could no longer play it properly. Wayne de la Cruz and Tammy Hall came several times. It was so much fun playing for Kelly. I knew of his music and work with the symphony, but I had no idea about all of the amazing things he did in dance and vaudeville. He was so humble and never tooted his own horn. I feel so blessed to have been a part of him ending his life the way he wanted to, surrounded by music, art, family and friends. I am dedicating my Fillmore set to him. He was very special and continues to bring the people who loved him together.